These issues face whistleblowers all too often. Thankfully, strong laws have been put into place to discourage retaliation against whistleblowers. Cal. Lab. Code § 1102.5. In other words, if an employee reports—either internally or externally—conduct that that the employee believes to be illegal, the employer cannot retaliate against the employee for doing so. Moreover, an employer cannot retaliate against an employee based on a belief that the employee might report the conduct in the future. Retaliation in this context includes termination (i.e., firing, letting go, laying off), demotion (in pay, position, or duties), and potentially other types of mistreatment as well. If an employer violates section 1102.5, they can be sued for money damages caused by the retaliation (lost income, primarily), and for injunctive relief (for example, forcing the employer to reinstate the employee). There are also significant protections for employees under the various federal and state versions of laws known as the False Claims Act. 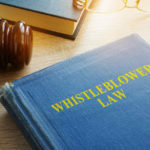 As discussed in other parts of this series, the False Claims Act allows whistleblowers to report fraud on the government, and obtain a reward for doing so. The False Claims Act also protects those who do so from retaliation. For example, the federal False Claims Act prohibits retaliation against an employee who does anything “in furtherance of” a False Claims Act case, or an employee to takes “efforts to stop” fraud against the government. 31 U.S.C. § 3729(h). An employer who violates these provisions can be sued for reinstatement, 2 times lost wages, interest, and other monetary damages. Many of the state versions of the False Claims Act contain identical or similar protections. As these examples show, lawmakers have recognized the risk that whistleblowers take, and enacted relatively powerful laws to protect them. Despite these laws, of course, unscrupulous companies will sometimes still punish whistleblowers—and intimidate others into keeping quite—by terminating, demoting, or generally making life difficult for employees who speak out. Standing up to fraud, however, is always the right thing to do. And the government has set up incentives for doing so, as we will explore starting in Part 3 of this series.